Last week I had the opportunity to interview Lord Monckton in The Woodlands, Texas, during a brief stop he made in the course of his recent trip to the U.S. In our meeting, Lord Monckton spoke in depth about three topics. For starters, he debunked man-caused global warming, illustrating that the U.N. climate models have dismally failed in their climate forecasts over a 15-year period and outlining the flawed arguments that global warming alarmists are attempting to use. He expounded on basic finance laws and how students today are no longer taught basic logic, including financial logic, and he raised some questions about digital defects apparent in Obama's birth certificate and suggested that he is just as eligible as Obama to run for president. 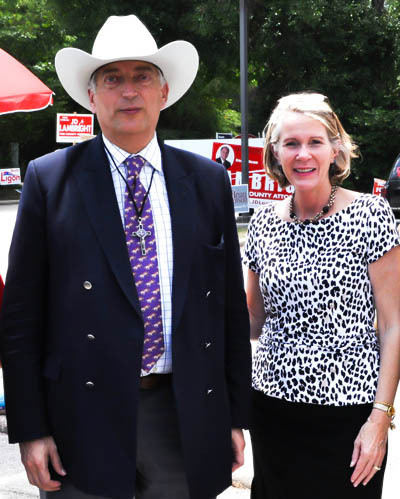 The picture is of Lord Monckton and me at The Woodlands primary election polls during early voting where he made a surprise visit to representatives of the Texas Patriots PAC, a Woodlands Tea Party organization. Lord Monckton remarked that here in the U.S., citizens are actively engaged in politics and, unlike Europe, still have some control over who gets elected in government to represent them. Monckton expressed his admiration for organizations like the Texas Patriots PAC, comprised of civic-minded residents of The Woodlands and Montgomery County who are taking an interest in their government and its elections and process. I'll be blogging about my visit with Lord Monckton soon after I've submitted the transcript for my upcoming new book Ladies Can We Talk? for publication! In the meantime, check out this video "Greenhouse Gasses are Harmless" of Monckton at the Climate Change Conference in 2009. In it, he makes the case that if we allow poor people in developing countries to burn as much fossil fuel as they want, then not only will their standard of living increase, but it will also have a stabilizing effect on world population without any human or morally questionable intervention required!